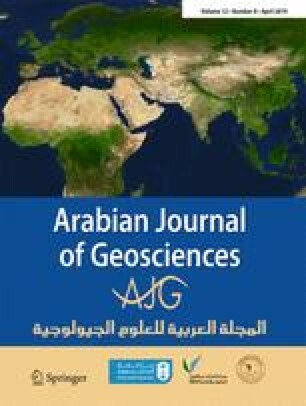 Hydrochemical characteristics of groundwater in the vulnerable tribal region of Gosthani river basin extended in Eastern Ghats hard rock terrain, Andhra Pradesh state, Southern India were determined. The occurrence of groundwater in hard rock terrain of this region is predominantly controlled by joints, fractures, porosity, and thickness of the weathered zone. The geoenvironmental conditions within aquifer are influencing the occurrence and concentration of chemical parameters of groundwater. In order to evaluate the quality of groundwater in the area, 24 groundwater samples were collected and analyzed for various physicochemical parameters such as pH, EC, TDS, TA, TH, Ca2+, Na+, K+, Fe, SO42−, NO3−, Cl−, and F−. Mg2+, HCO3− plus CO32−, Gibbs ratios, CAI, %Na, SAR, RSC, PI, KR, and CR were computed. The results revealed that the groundwater in the area is soft to hard water type. The abundance of the major cations are Ca2+>Na+>Mg2+ and major anions are HCO3−>Cl−>NO3−. The dominant hydrochemical facies of groundwater is Ca-Na-HCO3 and Ca-HCO3-Cl type. In the study area, the vulnerable tribal population lives in remote and inaccessible areas and is mainly dependent on groundwater for drinking and other purposes. The result of low concentrations of various chemical ions in the water suggested that less enrichment of mineral content caused various health hazards in the indigenous tribal population. Soil erosion, deforestation, and traditional shifting cultivation activities are encouraging for improper leaching of chemical constituents into the groundwater. Further, the high levels of iron found in 87.5% of samples are possibly by the source rock interaction with water. Overall, the assessment of water quality using WQIA and other methods indicates that some samples in the study region are chemically unsuitable for drinking and irrigation purposes. The present work provides baseline information in solving problems due to quality deterioration of the groundwater for implementing sustainable management practices in improving the living conditions of the tribes of this region. The authors would like to thank Prof. K. Narendra, Dept. of Civil Engg., GITAM University, Visakhapatnam, for his support and encouragement. We also thank the anonymous reviewers and editor for their perceptive comments and suggestions. The first author received assistance from Science and Engineering Research Board (SERB), Department of Science and Technology, New Delhi, in the form of Young Scientist Fellowship No. SR/FTP/ES-143/2010.